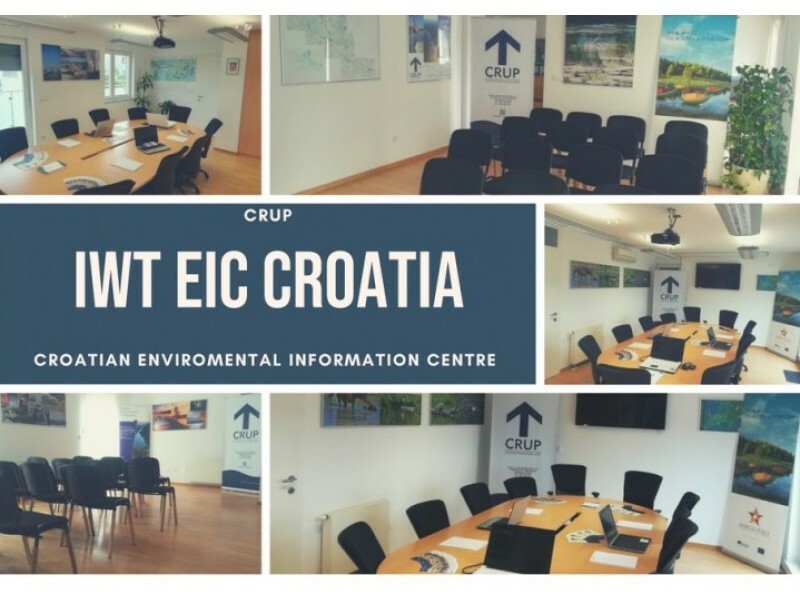 On December 7th, 2018 within activities of GREEN DANUBE project, Environmental Information Centre pilot activity organized by Inland Navigation Development Centre Ltd. (CRUP) was held at their headquarters in Zagreb, Croatia. At the first event organized in CRUP IWT EIC there were 27 participants, all of them from Faculty of transport and traffic sciences. It was a group of students from different organisation units within faculty: Water Transport, Railway Transport, Road Transport, Transport Logistic. 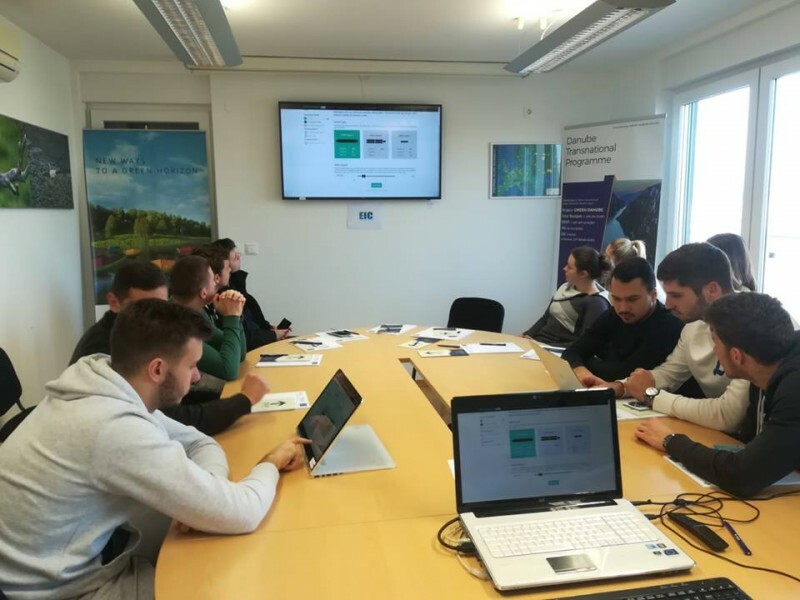 Students got an overview of project GREEN DANUBE and other EICs developed in project with explanations of background and context of EICs idea and goals, similar initiatives, good practices from other existing centers in the EU. Main purpose of this action was to raise students' awareness through presentation of project results, and overview of pollution caused by IWT. At the end of the pilot action there were presented online tools, like Greening toolkit and students got the opportunity to try out how Greening toolkit works, and test it entering different characteristics of vessel. 26. October 2018., Inland Navigation Development Centre Ltd. (CRUP) was organizing two workshops in Croatian Chamber of Economy, Zagreb, Republic of Croatia. Within Work Package 5 act. 5.3 was organized and presented National Validation Workshop on Policy Agenda for integration Draft of the Policy Agenda. Within Work Package 4 act. 4.4 the same day CRUP organized National Workshop on Greening Solutions for Inland Waterway Transport. 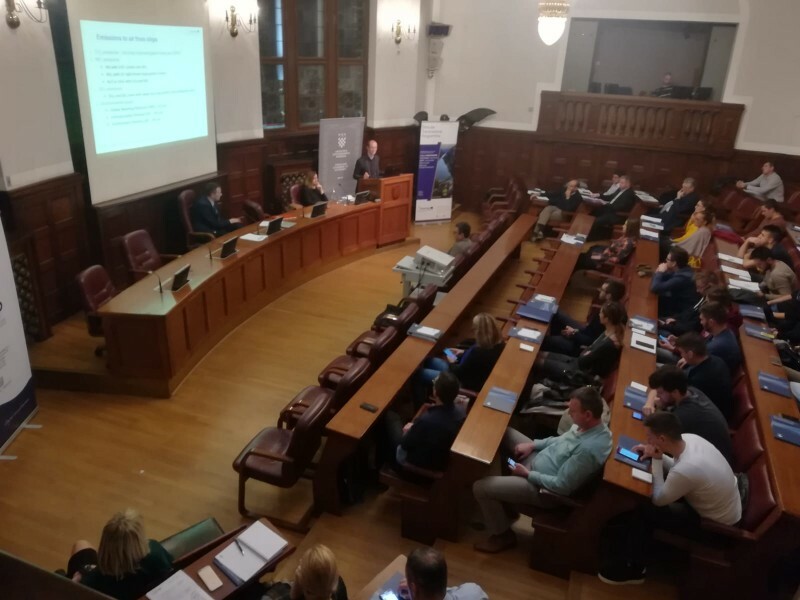 On workshops was attended 76 participants,and it is important to emphasize that assistant minister, Duška Kunštek, from the Ministry of Sea, Transport and Infrastrucutre were opening workshops and give a support to project GREEN DANUBE and similar initiatives. The primary purpose of the IWT Environmental Information Centre- IWT EIC- is to contribute to more effective information sharing to limit impact of IWT system on the Danube region environment by development of specific tools and organization of transnational pilot actions intended to raise public awareness on IWT environment protection. At the same time the EICs will provide interested individuals, institutions, companies and other target groups an information source regarding protection of environment in IWT sector and factual overview about status and ongoing trends on this important issue. The EICs provide information that covers a wide range of knowledge from environment in IWT sector, especially in the Danube sector, regarding the prevention of environment pollution by emissions from inland vessels. During the event “Open days of EU projects in Republic of Croatia” projects GREEN DANUBE and DANUBE SKILLS were promoted at Faculty of Transport and Traffic Sciences in Zagreb. Project „Discover Posavina – Development of Joint Tourist Offer of the Posavina Region“ officially ended yesterday, on the 10th June 2014. This project, financed by the European Union through the IPA cross-border cooperation programme Croatia-Bosnia and Herzegovina 2007-2013, was implemented by Centre for Environmentally Sustainable Development (COOR) from Sarajevo and Inland Navigation Development Centre (CRUP) from Zagreb. Project lasted 18 months, between December 2012 and June 2014, with the overall budget of 211.255 EUR. Objectives of the project were the support to revitalization of cross-border economy by stimulating tourism development in Croatia and Bosnia and Herzegovina through the development of recognisable joint tourist offer of the Posavina Region and promotion of the regional identity and tourist offer of the Posavina region. Location of the project included municipalities in Bosnia and Herzegovina (Gradiška, Kostajnica, Kozarska Dubica, Srbac, Orašje, Šamac and Brčko), and counties in Croatia (Sisačko-moslavačka, Brodsko-posavska and Vukovarsko-srijemska). The main results of the project, which were achieved in cooperation of project partners COOR and CRUP together with tourist communities and organisations, development agencies, representatives of municipalities and counties and tourist professionals from Posavina, are: creation of joint tourist packages of joint tourist offer of the Posavina region, establishment of Association of tourist professionals of Posavina, creation and printing of Tourist guide of the Posavina region and creation of Posavina tourist community web portal http://discoverposavina.savanavigo.net Promotional campaign of the tourist region Posavina was also carried out on national televisions and most popular web portals in Bosnia and Herzegovina and Croatia. It was planned for the finish of the project to organise a final event “Posavina tourism day” beginning of June in Slavonski Brod, but due to the catastrophic floods in the Posavina region that was not possible. Between June 5th and 9th the project partners visited Slavonski Brod, Županja, Šamac, Domaljevac, Orašje and Tolisa, where they visited tourist organisations and communities which participated in the project and donated humanitarian aid. Project partners also expressed their best wishes for the area to be restored in order to continue with the development of tourism, which has high potential in this beautiful region. + Workshop: "The proposal for a new EU directive on the award of concession contracts"
Inland navigation development centre in cooperation with the Danube Commission is organizing a workshop "The proposal for a new EU directive on the award of concession contracts." The workshop will be held on 12th december 2013 from 10.00 to 17.00 h, in headquarters of Danube Commission in Budapest, Benczúr u 25th, Hungary. On the workshop, it will be explained the changes that will make the adoption of the EU Directive on concession contracts and its impact on the further development of the Danube ports. Workshop is free of charge. Application form, and a letter of invitation can be downloaded here. Workshop on religious, cultural and heritage tourism in the Posavina region was held yesterday in Franciscan monastery Tolisa in municipality Orašje, as the last one out of four thematic tourism workshops within the project “Discover Posavina – Development and promotion of the joint tourist offer of the Posavina region”. The workshop was opened by the welcome speech of two project managers from Bosnia and Herzegovina and Croatia, Aleksandra Tomić Ćato from COOR and Renata Kadrić from CRUP, followed by the welcome of abbot fra Marijan Živković. The thematic programme started with the presentation of Oliver Oršolić from the Tourist community of Posavska county on the tourism and special attraction of this county, special kind of dark wood abonos. Željka Perković, head of the conservatory department in Slavonski Brod of the Ministry of culture of Republic of Croatia, presented the river Sava as a spring and guardian of the heritage and made a cross section of the most important religious, cultural and historical attractions in the Croatian part of Posavina. In the expert part of the workshop the main presenter was PhD Hajrudin Hadžidedić, expert for the development of selective types of tourism, which held a presentation on religious tourism, possibilities for its development and creation of new tourist product. The workshop ended with the discussion among the participants on potentials and most important religious and culture and historical sites in Posavina on both sides of the border and their inclusion in the joint tourist offer of the Posavina region. The workshop was followed by the tour of the church, museum and the library, which are parts of the monastery Tolisa. All the participants were delighted with the hospitality of the hosts Franciscans. This workshop also showed great potential of the Posavina region for the development of joint tourist offer, considering that this region has a rich history and culture and historical heritage and is full of historical and religious buildings and sites, on both sides of the river Sava. Project “Discover Posavina” is financed by the European Union through IPA cross-border cooperation programme Croatia and Bosnia and Herzegovina 2007-2013 and is implemented by Centre for Environmentally Sustainable Development (COOR) from Sarajevo and Inland Navigation Development Centre (CRUP) from Zagreb. Workshop on the development of rural tourism in the region of Posavina was held yesterday in Eco-etno village Stara Kapela, as one of the several thematic tourism workshops within the project “Discover Posavina – Development and promotion of the joint tourist offer of the Posavina region”. Participants in the workshop were the representatives of tourist community, local administration, chambers of commerce and development agencies from the Posavina region. The special guest of the workshop was Brodsko-posavka county prefect Danijel Marušić. The workshop was opened by the welcome speech of two project manager from Bosnia and Herzegovina and Croatia, Aleksandra Tomić Ćato from COOR and Renata Kadrić from CRUP, followed by the short welcome from Stjepan Bošnjaković, head of the Governing office for economy of Brodsko-posavska county. Vesna Rajković, head of the Sector for development of select tourism of the Ministry of tourism of Republic of Croatia gave a presentation on rural tourism and its development in Croatia. In the part of the workshop dedicated to Posavina the main presenter was Petar Huljić, director of the Tourist community of Brodsko-Posavka county, which presented the current status of the development of rural tourism in Croatian part of Posavina. Antun Staklarević, owner of the “Tunjina kuća”, beautiful estate where the workshop was held, shared his experiences and also problems he encountered while running a rural tourism business. Branka Mihajlović from the Tourist organisation of Republika Srpska presented the present development and potentials of rural tourism in Bosnian part of Posavina. Experiences and views on present and future co-operation between Croatia and Bosnia and Herzegovina were shared by Petar Huljić, Dinka Matijević, director of Tourist community of Nova Gradiška and Višnja Zdjelarević, owner of the Vinery Zdjelarević. The workshop ended with the lunch and tour of the Eco-etno village Stara Kapela. Workshop participants agreed on the conclusion that rural tourism in Posavina has a great potential for development because it combines several different tourist benefits of Posavina: beautiful nature, preserved tradition, excellent gastronomy and pleasant hosts. The other elements of the package represent the first steps towards implementation of the NAIADES II programme. The Staff working document is a contribution to the impact assessment of future initiatives in relation to the greening of the inland waterway fleet, the Proposal for a Directive laying down technical requirements for inland waterway vessels prepares for the implementation of a new approach to governance in inland navigation and the Proposal for a Regulation amending Council Regulation (EC) No 718/1999 intends to allow for a broader range of actions of the Reserve Funds available to support inland navigation. Moreover in the context of the River Information Services, the European Commission has adopted an implementing Regulation which introduces an harmonised electronic chart display information system (ECDIS). Implementation of the PLATINA II, follow-up of the successful PLATINA (Platform for the implementation of NAIADES) project, started on the 1st of September. PLATINA II project is financed by the EU FP7 programme, within the „Transport“ component. Main objective of this project is the support to the implementation of the new European action plan for the promotion and enhancement of inland waterway transport in Europe. Workshop on development of eco tourism in the region of Posavina wad held yesterday in the National park Kozara in Bosnia and Herzegovina. This workshop as organized in the framework of project “Discover Posavina – Development and promotion of joint tourist offer of the Posavina region”. The workshop was opened by the welcome speech of dr. Tarik Kupusović, chairman of the Centre for Environmentally Sustainable Development and was followed by thematic presentations: “Tourism in Bosnia and Herzegovina” presented by Brankica Pandurević, chief of the Department for tourism of the Ministry of Foreign Trade and Economic Relations BiH and “Nature/eco-tourism – present experiences” and “Potentials of eco-tourism in the touristic region of Posavina” presented by professor Jovo Ateljević. Dragan Romčević, director of the National park Kozara presented the park as an example of good practice in Bosnia and Herzegovina, while Milijana Borojević from the Development agency of Sisačko-moslavačka county (SI-MO-RA) presented their project “Bicycle for Tourism Without Frontiers – BIKE 4 TWF” as an example of good practice in cross-border cooperation. Workshop participants were mainly representatives of tourist communities and organizations, local administration, chambers of commerce and development agencies from the Posavina region from both sides of the Sava river. At the end of the workshop the participants were divided into working groups. Each group was given the task to elaborate specific ideas and aspects for development of eco tourism in Posavina. Presentation of these ideas was followed by very active discussion. It was concluded at the workshop that sustainable development and nature and bio-diversity protection of the tourist region Posavina are preconditions for the development of all kinds of tourism, but especially nature/eco tourism. It was also emphasized that the participation of local communities and also other levels of public administration is essential in all segments of environmental protection. Project “Discover Posavina” is financed by the European union through IPA cross-border cooperation Croatia – Bosnia and Herzegovina 2007 – 2013 and project partners are Centre for Environmentally Sustainable Development (COOR) from Sarajevo and Inland Navigation Development Centre (CRUP) from Zagreb. Within the project „Discover Posavina“, workshop on nautical tourism on the Sava river was held yesterday in Lonjsko Polje Nature Park. Workshop was opened by Ivo Bašić, advisor to the minister, from the Ministry of tourism of Republic of Croatia. He stated that nautical tourism on inland waterways in Croatia was on the margins of public interest until now, but this initiative contributes to encouraging dialogue on future development. Renata Kadrić from CRUP shortly presented the project „Discover Posavina“ and gave a review on current and future activities. In the thematic part of the workshop, presenters were Zrinko Zvocak from Port Vukovar, Milan Stevanović from Prvo parobrodsko društvo Beograd and Mario Vlahinić from Port authority Sisak. Zrinko Zvocak presented the previous development of nautical tourism on Drava and Dunav rivers, as well as possibilities for that experiences to be used as basis for development of this kind of tourism on the Sava river. Milan Stevanović shared his experience as an agent for river tours in Croatia, Serbia and Bosnia and Herzegovina and emphasized that the region of Posavina is an extremely interesting area from the tourism point of view. Mario Vlahinić presented the experiences of Port authority Sisak in construction and equipping the passenger terminal, and he also counseled the attendants on all the procedures and problems they can encounter in this process. The workshop ended with the presentation from Selma Osmanagić Klico from COOR on project initiative for foundation of association of tourist workers of the Posavina region, which would gather all the interested persons from both sides of the Sava river. After the workshop lunch was served on a tourist boat during the trip Klasje-Jasenovac-Klasje. Conclusion of the workshop is that there is a great potential and interest for development of nautical tourism on the Sava river, and that there is a need for more similar initiatives in order to gather the experts from this field, as well as representatives of local communities from the Posavina region. Project „Discover Posavina“ is financed by the EU through the IPA cross-border programme Croatia-Bosnia and Herzegovina, and is implemented by project partners Centre for Environmentally Sustainable Development (COOR) from Bosnia and Herzegovina and Inland Navigation Development Centre (CRUP) from Croatia. TV feature from the workshop can be seen on the following link. Public presentation of project „Discover Posavina – Development and Promotion of Joint Tourist Offer of the Posavina Region“ was held on 21st March 2013 in Srbac, Bosnia and Herzegovina, at the protected wetland area of Bardača. Project „Discover Posavina – Development of Joint Tourist Offer of the Posavina Region“ is financed by the European Union within the IPA cross-border cooperation programme Croatia – Bosnia and Herzegovina, and being implemented by Centre for Environmentally Sustainable Development (COOR) from Bosnia and Herzegovina and Inland Navigation Development Centre (CRUP) from Croatia. Main objectives of the project are support to revitalization of cross-border economy by stimulating development of joint tourist offer and promotion of regional identity and tourist offer of the Posavina region. Project manager Aleksandra Tomić-Ćato from Centre for Environmentally Sustainable Development from Sarajevo emphasized that this project is a follow-up of successfully implemented project Sava Navigo. She also thanked to the main sponsor of this project, European Union, which recognized the quality of the project idea as well as the tourist potentials of this region. „We were satisfied with the former cooperation with our project partner CRUP from Zagreb, which is a good precondition for successful realization of current project. Participation of numerous tourist organizations from both countries at today's public presentation is a reason we expect our planned results to be realized“. CRUP is also very optimistic about joint partnership with COOR and cooperation with tourist organizations in the project. „This is our second joint project related to the development of tourism in the Posavina region and we see that there is a great potential for further development. In future projects we plan a stronger cooperation and participation of tourist organizations from this region, because this is a prerequisite for sustainability of our project results“, said deputy project manager Renata Kadrić from CRUP. Duško Isaković, advisor for navigation technical issues from the International Commission of the Sava River Basin, emphasized the high aesthetic and environmental value of the Sava river basin, which is recognized as the potential for tourism development. „Development of nautical and recreational tourism, eco-tourism, cultural and socially responsible tourism and other types of tourism, has a great potential for the development of joint tourist offer and cross-border cooperation in the region. Sava Commission has recently decided to became more active in this kind of projects which have a cross-border impact“, said Isaković. Following workshops, which will be organized within the project which will last for one and a half year, will cover different types of tourist potential of the Posavina region. International conference „Sava River – A Transport Corridor and Tourist Destination“, organized by International Commission for the Sava River Basin (Sava Commission), was held in Belgrade on 6th March 2013. The objective of the conference was to gather all interested parties and stakeholders from the Sava river basin in one place and to present development plans and programmes from the inland navigation sector, within the general policy for development of European inland waterway network, as well as present current and planned activities in the area of tourism development. The conference, which was opened by Serbian transport minister Milutin Mrkonjić, attracted more than 80 participants, representatives of government sector, non-government organizations, business and academic sector from the field of inland waterway transport, tourism, water management and environmental protection from all countries members of the Sava Commission (Slovenia, Croatia, Bosnia and Herzegovina and Serbia). Participants of the conference were also Karla Peijs, European coordinator for inland waterways and other representatives of the European Commission, representatives of International Commission for the Protection of the Danube River, Danube Commission, EU Danube strategy and other international organizations and institutions. The participants of the conference clearly expressed the necessity that the Sava river waterway should be brought to a fully navigable state as soon as possible. It was also stressed that the Sava Commission, in cooperation with the member states, should make further and extra efforts to overcome all existing difficulties in the implementation of the project of rehabilitation of the Sava river waterway. It has been also confirmed that there is a great potential and interest in the region for the development of all aspects of sustainable tourism (nautical, recreational, eco-tourism etc.) In this respect, Sava Commission was recognised as a good framework for further involvement of stakeholders from all Sava riparian countries and all sectors of society, as a mechanism for more effective preparation and implementation of cross-border projects and as a platform for coordinating further activities within the basin in the field of sustainable tourism. The first partner meeting of the project “Discover Posavina – Development of Joint Tourist Offer of the Posavina Region” was held in Sarajevo on 8th February 2013. This project is EU co-financed through the IPA Cross Border Cooperation Programme Croatia – Bosnia and Herzegovina. The project with the total budget of 211.255 EUR will be implemented by Centre for Environmentally Sustainable Development (COOR) from Sarajevo and Inland Navigation Development Centre (CRUP) from Zagreb. The project officially started on 11th December 2012 and will last 18 months. This project is a follow-up of the project “Sava Navigo – Development of Nautical Tourism on the Sava River and Promotion of the Posavina Region”, which was successfully implemented in 2011 by the same project partners. Main objectives of the project are support to revitalization of cross-border economy by stimulating tourism development in Croatia and Bosnia and Herzegovina, development of recognisable joint tourist offer of the Posavina region and promotion of the regional identity and tourist offer of the Posavina region. End users of the project will be tourist offices and organizations of the Posavina region, tourists, local communities and citizens. During the course of the project it is planned to organize several thematic workshops on tourist potentials of all town and cities included in the project and possibilities for creation of joint tourist offer, as well as establishment of the Association of tourist organizations of the Posavina region and creation of promotion plan and tools for promotion of regional identity and joint tourist offer. Introductory event of the project is planned for the second half of March 2013, with the objective to gather representatives of all tourist offices and municipalities from the Posavina region, as well as other interested parties from Croatia and Bosnia and Herzegovina. Kick-off meeting of the HINT (Harmonized Inland Navigation Transport through education and information technology) project, co-funded by the South East Europe Transnational Cooperation Programme (SEE), was held in Bucarest on 31st January. HINT project is a follow-up of the NELI (Cooperation-Network for logistics and nautical education focusing on Inland WaterwayTransport in the Danube corridor supported by Innovative Solutions) project. The project formally started in September 2012 and will last until August 2014. Project partners include fourteen former NELI partners plus additional four new partners, which sums up to 18 partners from 8 countries. Representative of Croatia in the project is Inland Navigation Development Centre, which also participated in NELI project. 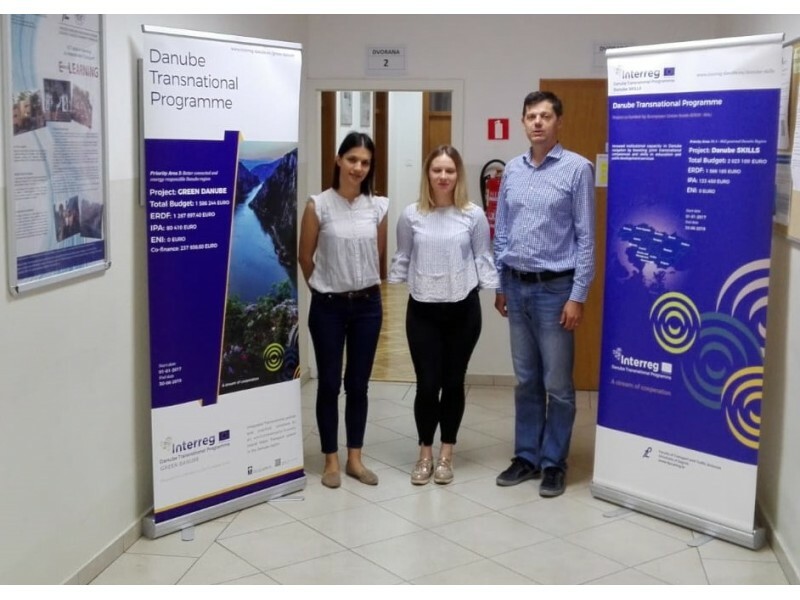 This project is also based on the guidelines of the Danube strategy, emphasising that the current problem for the navigation on the Danube is the shortage of nautical personnel, which is caused by limited opportunities for training and education in Danube countries. Therefore, it is planned to strengthen the transnational partnership in education and training in inland navigation through the HINT project. Promotion of jobs ad carriers in the inland navigation sector by transnational job campaigns and pilot actions organized in new information and training centres in Bulgaria, Slovakia, Serbia, Croatia, Romania and Austria, which will be developed or enhanced during the project. + Merry Christmas and Happy New Year! Employees of Inland Navigation Development Centre wish you a nice and relaxing Christmas holiday and very successful new 2013. Third edition of the Barge to Business conference will take place on 12th and 13th December in Rotterdam. In the last few years this conference managed to establish itself as the main European inland waterway transport event. The conference represents the place where the inland waterways industry meets its clients, where logistics managers meet suppliers and where the business community meets to discuss key issues to move more transport by inland waterways. This year's conference is also divided into two parts: conference and riverdating. The conference programme includes interesting topics: seaport-hinterland optimisation, European policy on inland waterway transport, green logistics, new infrastructure and bundling continental cargo. Riverdating gives an opportunity for potential business partners to schedule short information meetings, which requires prior registration. Project PLATINA – Platform for the implementation of NAIADES, formally ended on October 31st. This project was launched in June 2008 with the goal to find concrete solutions for the implementation of NAIADES, action plan for the improvement of inland waterway transport in Europe. The project was financed by the European Commission through FP7 programme, and included 23 partners from nine European countries. Representative of Croatia in the project was Inland Navigation Development Centre (CRUP). The main objective of PLATINA was to support the European Commission, Member States and third countries in the implementation of NAIADES action programme by bringing together all the relevant actors in the inland waterway sector in a multi-disciplinary knowledge network and creating comprehensive support to the objectives of the European transport policy. These objectives were achieved by providing technical, organisational and financial support for targeted policy actions and building on strong interrelations with existing expert groups, projects and initiatives. Project partners were various organisations and institutions from the inland navigation sector: waterway operators and administrations, representatives of the inland navigation and fleet operators, promotion and development organisations, inland navigation educational institutions, international river protection commissions and experienced consultants and research institutes. Currently, there are negotiations going on between the PLATINA consortium and European Commission on the continuation of the project, project PLATINA II, which is planned to start next spring. Second edition of regional conference „Intermodal transport and development projects“ was held on Thursday 27th September in the premises of Croatian Chamber of Economy in Zagreb. The conference was sponsored by the Ministry of Maritime Affairs, Transport and Infrastructure and organized by Croatian Chamber of Economy, Intermodal Transport Cluster and Faculty of Transport and Traffic Sciences. Welcome speeches at the beginning of conference were held by Maja Markovčić Kostelac, representative of the Ministry of Maritime Affairs, Transport and Infrastructure, Ljubica Herceg, director of the Sector for transport and communications at the Croatian Chamber of Economy and professor Natalija Jolić, head of the Institute for water transport at the Faculty of Transport and Traffic Sciences. The objective of this conference was to emphasize the importance of intermodal transport in future development of Croatia. For the last twenty years intermodal transport was in the focus of all European transport and development strategies, but it’s a new topic in this region. Regardless the old infrastructure, Croatia should focus more on connecting different modes of transport: maritime, rail, road and inland waterway transport. It was concluded at the conference that, in order to promote, develop and upgrade the intermodal transport in Croatia, more focus should be out on the co-financing from the EU funds available. In the first part of the conference current developments in the organization of all modes of transport with the focus on intermodal transport were presented by the renowned experts. The second part of the conference was dedicated to the overview of all EU co-financing programmes which can contribute to the development of all parts of transport network, including infrastructure, but also new transport services. Experts from Croatia which participated at the conference were: D.Sc. Borna Abramović from the Faculty of Transport and Traffic Sciences, D.Sc. Dejan Komatina from the international Commission for the Sava River Basin, M.Sc. Bosiljko Zlopaša from the Customs Authority, Goran Zeković from Croatian Institute for Technology, Dražen Žgaljić from Intermodal Transport Cluster, Kristina Cappucci from Croatian Chamber of Economy, Ksenija Slivar from the Ministry of Regional Developments and EU funds, and as a representative of Inland Navigation Development Centre M.Sc. Renata Kadrić. Colleagues from Europe and USA which participated at the conference were: Christian Grotemeier from BSL Transportation- Consultants from Hamburg, D.Sc. Kuppusamy Thirumalai from George Mason University from Fairfax, D.Sc. Peter Schneyder from PAN PLAN from Vienna, Gerhard Schilk from via donau from Vienna and Dimitrios Tsamboulas from the National Technical University from Athens. In the afternoon, in the framework of conference, 7th International Scientific Conference on ports and waterways POWA 2012 was held. This year with the title “Water transport in the context of regional development”. Numerous scientists and experts from the field of transport from Croatia and Europe participated at this year’s scientific conference. Scientific article “Safety of harbours, anchorages, terminals and other infrastructure objects” written by Ivan Šuker from Inland Navigation Development Centre, in cooperation with Vladivoj Valković and Jasmina Obhodaš, was also presented. On 6th September 2012, the EU project IRIS Europe 3 („Implementation of River Information Services in Europe“), was kicked-off in Bucharest. The project will last for 36 months and will significantly contribute to a harmonized RIS implementation at the European level. The main coordinator of the project is via donau, the Austrian Waterway Maintenance Agency based in Vienna. IRIS Europe stands for „Implementation of River Information Services in Europe“ and represents an international initiative, supported by the European Commission within the TEN-T funding programme, with the main objective to foster harmonized development and implementation of RIS on European level. The focus of this initiative is put on the enhancement of RIS service portfolio in order to increase safety, efficiency and environmental friendliness of inland navigation. A key objective of IRIS Europe 3 is the involvement of logistics RIS users by means of pilots. Ensuring minimum service level quality for the commercial users of the waterway. There are 13 project partners from seven European countries (Austria, Bulgaria, Czech Republic, Hungary, Poland, Romania and Slovakia). Inland Navigation Development Centre is participating in the project as the representative of Croatia in the role of observer. Second edition of the regional conference „Intermodal transport and development projects“ will be held in Croatian Chamber of Commerce in Zagreb on 26th and 27th September. The objective of the conference is to present the current situation, possibilities and advantages of the intermodal transport in the Southeast Europe region, as well as the possibilities of project co-financing through the EU funds. First day 26th September is dedicated to the 7th international scientific conference „Ports and waterways – POWA“, with the working title „Water transport in the context of regional developments. This year's POWA has an objective to analyze existing and future strategic guidelines for the development of transport in the region. The second day 27th September is dedicated to the professional part of the conference. Morning hours are reserved for the presentations on current topics and innovative approach in the development of transport system. The presenters from the entire Southeast Europe will talk about the new approach and necessity of liberalization of rail market, necessity of change of business administration in the transport sector and joint cooperation of all transport modes, informatization of entire transport chain, environmental aspect and other valuable topics. Additional benefit of this conference is the afternoon session which will present all the EU financial programmes oriented towards transport sector. Conference will be held in Croatian and English language. Participation is free of charge for everybody. The organisers are Intermodal transport cluster, Croatian Chamber of Commerce and Ministry of Maritime Affairs, Transport and Infrastructure. For more information please contact Mrs Tanja Vujnović from the Intermodal Transport Cluster by e-mail vujnovic@shortsea.hr or phone 051 344 252 . + Be your own captain! The recruitment advertising campaign „Be your own captain“, developed within PLATINA, started beginning of August. In the framework of the campaign a web portal was developed www.becaptain.eu, which provides comprehensive information about the topics „Education“, „Internship“ and „Personnel Advertising“ in inland navigation and addresses a broad audience. At the start of the campaign, Georg Hütte, president of Bundesverband der Deutschen Binnenschifffahrt (BDB) stated that inland navigation offers great promotion perspectives and development potential due to the age structure of the personnel. Jobs in this sector are attractive because of the diversity of tasks, the involvement of modern technology and good salary. Web portal www.becaptain.eu provides the information on recruitment in inland navigation in Austria, Germany, France, Croatia, Belgium, Hungary, Netherlands and Romania. Companies from the sector here can find guidelines for the topics „Education“ and „Internship“, that show the added value of apprentices on board. The information folder „Personnel advertising“ delivers valuable tips for effective recruitment in inland navigation. Furthermore, a picture database is provided to enable companies to attractively illustrate their recruitment campaigns. Besides companies from the sector, this portal addresses especially young adults which are in doubt choosing their profession, but also older population wishing to change their careers. On June 20th the European Commission announced the 2012 call for Marco Polo II programme. This programme is aimed at the cargo transport field and helps to reduce the burden off the raod transport and its negative effects on the environment by shifting the cargo on rail, maritime transport and inland navigation. Countries eligible for participation int his programme are all the Member States, Norway, Island, Lichtenstein and Croatia. Last week, the Council of the European Union agreed on a general approach on a draft regulation establishing the Connecting Europe Facility (CEF), the future funding instrument for the trans-European networks (TEN) in the period 2014-2020. The CEF allocates EUR 31.7 billion to transport networks, 80% of the sum are earmarked for ten European multimodal corridors. Considering that Croatia will become a full EU member as of July 1st next year, our transport network will be included in the trans-European transport network and will be eligible for funding through the CEF programme. The draft CEF regulation determines the conditions, methods and procedures for the Union’s financial contribution to TEN projects, while the development strategies, priorities and implementation measures for each of the sectors are defined in sector-specific policy guidelines (TEN-T guidelines). Earlier this year, the European Commission has proposed EUR 50 billion for the CEF in the period 2014 to 2020, with EUR 31.7 billion (including 10 billion earmarked in the Cohesion Fund) allocated to the transport sector. The funding is tightly focused on the core transport network. 10 multimodal corridors will receive 80% of the funding, because they are seen as an instrument to implement the key stretches of the core network. Furthermore, innovative financing instruments are introduced (e.g. project bonds) to leverage additional investment from private and public sources. The future TEN-T network will consist of two layers: a core network to be completed by 2030 and a comprehensive network feeding into this at regional and national level, to be completed by 2050. The core network will prioritize the most important links and nodes of the TEN-T and the comprehensive network shall ensure full coverage of the EU and accessibility of all regions. Both layers include all transport modes: road, rail, air, inland waterways and maritime transport as well as multimodal platforms. For inland waterways, the core and the comprehensive network coincide. The core network covers all the existing or planned waterways of class IV or higher and selected inland ports. Inland ports are part of the comprehensive network if the annual freight transhipment volume exceeds 500.000 t. Implementing River Information Services and providing alternative fuels are key requirements for inland waterways. For the core corridors, strict rules will be set with regard to planned works by 2030. Multi-modal coordinators will be designated to implement corridor development plans agreed together with Member States, infrastructure managers, regional authorities and relevant users, and search for financing resources. Negotiations on the CEF budget are expected to be finished in December 2012, while the CEF and TEN-T guidelines shall be adopted until the end of 2013. At the Transport Council meeting in Luxembourg on 7th June, the signatories to the Danube Convention, having ratified the European Agreement on Main Inland Waterways of International Importance (AGN), formally reiterated to maintain good navigation status through a joint ministerial declaration. The ministers of Austria, Bulgaria, Croatia, Germany, Moldova, Romania and Slovakia signed the declaration, while Serbia and Bosnia and Herzegovina have sent letters of support for the declaration. Hungary did not sign the declaration. The signatories committed to co-ordinate actions through the structures of the Danube Strategy and the EU Inland Waterway Coordinator Karla Peijs. The governments will put in place national and cross border co-ordination procedures by next year to respond to extraordinary conditions and re-establish optimum and safe navigation conditions. They also promised to organise continuous communication on the fairway situation, to monitor implementation ant to report regularly. They will meet at least once a year to ensure implementation as agreed. Both responsible EU Commissioners Siim Kallas (transport) and Johannes Hahn (regional policy) applauded the ministerial Danube declaration and hope that Danube blockades due to the low water levels like last year, which caused more than €6 million worth of losses will be avoided in the future and that predictable conditions for shipping will restore confidence in efficient and low carbon waterway transport. Under the Belgrade Convention, which lays out the broad international regime for the Danube, each country is obliged to maintain its section of the river in navigable conditions for river-going and, where applicable, sea-going vessels. The agreement recognises the importance of inland navigation to the European economy, especially of the Danube as a part of the TEN-T network with huge growth potential. The EU Danube Strategy aims to increase cargo transport on the Danube by 20% by 2020, with effective infrastructure management in place by 2015. This week, the European Commission Staff Working Document „Towards NAIADES II“ has been released. This revision of the NAIADES action programme sets out the orientations for the further actions of the NAIADES II Communication, which is foreseen in 2013. In the Staff Working Document presented, the Commission demonstrated concrete actions under preparation, as well as financing possibilities for inland waterway transport for the period 2014-2020. The Staff Working Document „Towards NAIADES II: Promoting, greening and integrating inland waterway transport in the single EU transport area“ clearly states the main goals for a new approach for NAIADES II: to reverse the current trend of subdued performance of inland navigation in comparison to other transport modes with respect to volumes of freight transport and with respect to sustainability. Information exchange and sharing – evaluation and new strategy of the River Information Services policy. In the last ten days CRUP had two media coverages. First, on Friday 23rd March TV broadcast on EU funds aired a feature dedicated to the World Water Day, where the possibilities for management and usage of Croatian rivers were presented. In the same feature, our colleague Marina Tušek presented the activities of Inland Navigation Development Centre (CRUP), our projects and the project for which she was responsible Sava Navigo, dedicated to the development of nautical tourism on the river Sava. Marina Tušek was also a guest in the radio show „Voice of Croatia“, which was broadcasted on the 2nd programme of Croatian radio on Wednesday 28th March. In this radio show Marina presented the possibilities, activities and future plans of Croatian inland navigation, especially in the light of the up-coming accession of Croatia to the European Union, which significantly supports this mean of transport. Part of the show was also dedicated to the activities and projects of CRUP. The radio show can be heard at the Croatian Radio and Television website http://www.hrt.hr/ Just click on the „Radio na zahtjev“ and under „Mreža“ choose „Glas Hrvatske“. We hope that the interest of Croatian media for inland navigation will continue in the future, considering that this topic didn't get many media space until now. On the 20th and 21st March 2012 NELI Final Event was organized in Contanca, Romania. Three-year long project NELI (Cooperation-Network for logistics and nautical education focusing on Inland Waterway Transport in the Danube corridor supported by innovative solutions) was implemented within the EU South East Europe Transnational Cooperation Programme (SEE). Objectives of the project were to solve specific problems such as discrepancies between national educational systems in the field of inland waterway transport, lack of interaction and communication between training institutions and stakeholders in the sector, limited number of harmonized initiatives, scarce or lacking eLearning services and insufficient promotion of the inland waterway transport sector. Project partners, which include 15 different institutions from 8 South-East Europe countries (Austria, Bulgaria, Croatia, Hungary, Romania, Slovakia, Serbia and Ukraine), managed to create a cooperation network between partners and stakeholders involved in inland waterway transport, provide support to education and training specialized entities, make an in-depth analysis of education and training in the field of inland waterway transport and advocate inland waterway transport through promotion actions. Two partners from Croatia participated in the project: Inland Navigation Development Centre (CRUP) and Faculty for Transport and Traffic Sciences of the University of Zagreb (FPZ). Key project activities performed in Croatia were development of the Master plan for RIS training centre in Croatia, equipping of RIS training centre, organization of RIS trainings in the centre, development of IneS platform for online education and development of National action plan for education. The event created the framework for a guided tour through project results, from virtual (cooperation network and eLearning tools and content) and factual (training materials, action plans, strategies) to the most tangible ones (Information and Training Centres along the Danube river). NELI Living Lab was also organized at the event, which presented a small scale replica of the Information and Training Centres developed in four of the participant countries and a means to promote IWT in all its aspects. The second day of the event was reserved for the visit to the port of Constanta and premises of the lead project partner CERONAV. NELI project partners plan to continue their cooperation in the future, possibly through the follow-up of the project which was applied for the last year's call of the SEE programme. On the 14th and 15th of March 2012, almost 400 delegates from 25 countries gathered in Vienna at the Aula der Wissenschaften to discuss today's and tomorrow's issues of inland navigation. Lively presentations and discussions covered a wide range of topics, such as new technologies and innovation in logistics, improving connectivity between road, rail and water, shipping agricultural products and, of course, in Vienna, the growing use and development of the Danube. The range of participants comprised of national and EU transport policy makers, logistics managers, waterway authorities, port managers, independent skippers as well as technology developers, who all showed great interest and active participation. Among the speakers at the conference were Johannes Hahn, European Commissioner for Regional Policy; Jean-Eric Pacquet, Director European Mobility Network (DG-MOVE); Karla Peijs, European Coordinator Priority Projects no.18 and 30; Brigitte Grouwels, the Minister of Public Works, Transport, IT and the Port of Brussels in Belgium's Brussels regional government; and Christian Weissenburger, General Director of the Department of International Affairs, Austrian Federal Ministry for Transport, Innovation and Technology. Zrinko Zvocak from Port Vukovar also participated in one panel discussion as a representative of Croatian inland navigation. In addition, representatives from the ports of Vienna, Berlin, Paris, Antwerp and Constanta shared their experiences with company representatives from Hapag Lloyd, Imperial, Rhenus Logistics, Mainrom Line, BLG Logistics, Borealsi, Agrana etc. Besides the key note speeches and the technical presentations, special space was reserved for „Danube Business Dating“. This was a platform of pre-arranged meetings that enabled logistics managers wanting to find out how to „add water“ to their supply chain to meet waterway operators in the Danube region wanting to reach out to new markets. This event alone enabled more than 200 business to business meetings. Croatian companies Nautica Vukovar, Port Vukovar and Port Tranzit Osijek also participated at the „Danube Business Dating“. In general, very positive feedback of the attendees showed that the choice of topics and participants was highly appreciated and that the conference as a whole was a great success. After the first Barge to Business event in Brussels in December 2010, the second edition in Vienna clearly confirmed the sector's strong demand for specialised events dealing with inland navigation in Europe. Final conference in the scope of the Sava Navigo – development of the nautical tourism on the Sava River and promotion of the Posavina region project will be held on 21st December 2011 at 11:00h at the hotel Panonija in Sisak, Croatia. This event will be the opportunity for all the participants to get introduced to the Sava Navigo project results and to receive promotional materials that were created within the project. Tourist nautical chart atlas of the Sava River, tourist maps, brochures and multimedia presentations for the promotion of the Posavina region are created and will be distributed to the all conference participants. The European projects RISING and IRIS Europe II will hold joint final event in Duisburg, Germany on 1st December 2011. After an introduction on River Information Services as well as the role and vision of the European Commission, several concrete applications will be presented. RIS applications in the fields of transport planning, tactical transport monitoring, strategic transport and lock planning will be presented and demonstrated. A presentation on the use and expectations of RIS by logistics service providers and an interactive panel debate round off the programme. Presenters and participants at the final event will be representatives of the European Commission (DG MOVE), RISING and IRIS Europe II project partners, as well as representatives of the logistics companies from Europe. RISING (RIS Services for Improving the Integration of Inland Waterway Transport into Intermodal Chains) project started in February 2009 and will be finished in February 2012. The main objective of the project is to integrate the inland waterway transport into the intermodal transport chain with the help of RIS. Project is a collaboration of 23 partners from 11 European countries and it covers geographic area from Norway to Greece, including three great European inland waterway network areas – rivers Rhine and Danube and German inland waterway network. Inland Navigation Development Centre (CRUP) from Zagreb participates in this project as a representative of Croatia. IRIS Europe II is a follow-up project of the IRIS Europe I project, which was coo-financed by the TEN-T (Trans-European Networks) and lasted until 2008. Within the IRIS Europe I eight European countries participated in the pilot implementation of the RIS. The follow-up project (which lasts from January 2009 to December 2011) is dedicated to the expansion and enhancement of RIS within an extended geographical and functional scope. Inland Navigation Development Centre (CRUP) participated in both IRIS Europe projects as associated partner. Two-day regional conference „Intermodal transport and development projects“, organized by the Intermodal Transport Cluster and Croatian Chamber of Economy, was held on 12th and 13th October in Zagreb. The conference was opened by Captain Mario Babić, state secretary for the sea in the Ministry of the Sea, Transport and Infrastructure. The Ministry was also the sponsor of the conference. The main objective of the conference was to introduce the participants with the current status, possibilities and benefits of intermodal transport in the South East Europe, as well as with the possibilities for EU financing for projects dedicated to the intermodal transport. It was emphasized at the conference that the establishment of international and national intermodal transport, which also implies the reduction of road transport load and its negative effects on the environment, is the precondition for development of Croatian transport system. This is especially important in the light of immediate accession of Croatia to the EU, where it is expected that by 2020 almost 40 percent of the freight transport will be intermodal. State secretary Babić said that before our accession to the EU we need to prepare for the market opening for our shippers and ports, as well as for the preparation of the projects which will be nominated for EU funds. He also announced that the new Strategy for the transport development of Republic of Croatia will be adopted soon and that intermodal transport will have a great significance in the strategy. He reminded the participants that, due to the slow development of intermodal transport in Croatia, Intermodal Transport Cluster was founded four years ago. Intermodal Transport Cluster includes all participants of the transport chain. According to Mr. Babić, to achieve greater development of this mean of transport it is necessary to remove administrative and regulatory barriers and to deepen the inland waterways. Slavko Štefičar form the Union for Railways emphasized the importance of the rail for intermodal transport and the fact that Croatia is currently within the European average in percentage of rail transport in overall freight transport with 18 percent. New studies foresee that by the year 2020 almost 40 percent of the freight transport will be intermodal. Important part of the intermodal transport are also logistic centres or intermodal terminals, for which, according to professor Natalija Jolić form the Faculty of Transport and Traffic Sciences, there are 16 potential locations in Croatia which need more attention and investments. Marco Polo II, EU programme which supports the increase of intermodal transport, was also presented at the conference. This programme runs from 2007 to 2013 with the total budget of 450 million EUR. Besides 27 European member states, non-member states can also participate and the programme co-financing is 35 to 50 percent of all eligible costs of the project. At the last year's call only three project applications with Croatian partners were received and only one project was approved. In the afternoon of the first day of the conference 6th international scientific conference „Ports and Waterways – POWA 2011“ was held. Second day of the conference was dedicated to the presentation of European funds for the development of transport system: IPA, FP7, Marco Polo II, CIP and TEN-T. The theoretical part was followed by the practical workshops where the participants had a chance to practice for the application for the projects for EU funds. In the framework of IPA programme (Instrument for Pre-Accession), in the component which concerns the cross-border cooperation, two calls for proposals were recently published: call within the IPA Cross-Border Programme Croatia – Bosnia and Herzegovina 2007-2013 and call within the IPA Cross-Border Programme Croatia – Serbia 2007-2013.
International scientific conference „Ports and Waterways – POWA 2011“ will take place on 12th October in Croatian Chamber of Economy in Zagreb. This is the sixth POWA in a row, with previous conferences held in Split (2006), Vukovar (2007), Dubrovnik (2008) and Zagreb (2009 and 2010). This year's conference is organised by the Faculty of Transport and Traffic Sciences of the University of Zagreb, KIP Intermodal Transport Cluster and Croatian Chamber of Commerce. International scientific conference „Ports and Waterways – POWA 2011“ entitled „Transport market: Intermodality and liberalization“ aims to analyze the intermodal transport systems as well as existing and future transport strategies from the aspect of transport market liberalisation of water and land transport. Aim of this conference is to analyze and to develop awareness about: environmental protection, ICT and e-learning, intermodal transport systems, transport safety and security, legal issues and transport strategies related to management and planning of ports and water transport in the world with an emphasis on the Republic of Croatia and the Adriatic Sea. Vienna will be hosting the next BargetoBusiness event on 14th and 15th March 2012, when the city on the Danube will be the focal point for all who are interested in inland waterway transport in Europe. BargetoBusiness provides the perfect place for business to learn about inland waterways transport, and the cost and environmental benefits it offers. They can find out how technology and innovations on the waterways are solving transportation challenges, speak to industry experts on the specialist services available, and hear first hand success stories of water transport. The event will provide a meeting place for logistics and transport managers, waterways operators, barge owners and other water transport service providers. Policy makers and politicians will complete the stimulating mix. BargetoBusiness 2012 will include Danube business meetings, which will bring together in scheduled meetings water transport operators and their potential clients. It will be an ideal forum for networking and generating new business. BargetoBusiness 2012 is organised by the PLATINA project. PLATINA is funded by the European Commission (DG-MOVE) under the 7th Framework Programme for RTD. Representatives of seven Harbour Master Offices on river Sava from Croatia, Slovenia, Bosnia and Herzegowina and Serbia had met in Slavonski Brod on 28th September, in order to discuss the safety issues regarding the navigation on the river. „In coordination with the Sava Commission, which is a transnational institution which coordinates all joint issues and problems on the river Sava, we have considered possible problems and exchanged experiences in order to enhance the safety of navigation on the river. When we are talking about the fairway, Croatia is in the process of rehabilitation within the IPA project“, said Captain Joško Nikolić, director of the Directorate for navigation safety and protection of sea and inland waters in the Ministry of the Sea, Transport and Infrastructure. Captain Nikolić emphasized that the project documentation for the rehabilitation of the Sava river inland waterway will be finished by the end of the year. Croatia will, with the help of EU funds, try to primarily solve the problem of navigability and depth, with the goal to make Sava navigable 365 days per year. At the meeting, Croatia also initiated the creation of joint Internet application which would be available to all institution responsible for inspection supervision of vessels. „The data entered in Croatia would be available right away to the institutions in Serbia, Bosnia and Herzegowina and Slovenia. All the responsible institutions in the Sava river basin would have the information on the category of the ship, what kind of difficulties they could encounter regarding the ship and whether the crew or the company are trying to remove the difficulties.“, said Nikolić. Low water levels of the Sava are more often causing difficulties for the navigation and the ships even from countries which don't belong to the Sava river basin. This year, even river cruisers from Belgium have cancelled their navigation due to the low water levels upstream. Captain Stjepan Benić from the Harbour Master Office Slavonski Brod considers the main barriers for the navigation on the 267 kilometres of the inland waterway along the Brodsko-posavska and Vukovarsko-srijemska counties to be the shallows near Slavonski Šamac and Novi Grad. Inland Navigation Development Centre Ltd. celebrates today its eight birthday! At this occasion we would like to thank all our partners and colleagues for their continued help and great cooperation in our work! Conference under the name „Intermodal Transport and Development Projects“, in organization by the Ministry of the Sea, Transport and Infrastructure, Croatian Chamber of Economy and Intermodal Transport Cluster, will be held on 12th and 13th October in the premises of Croatian Chamber of Economy in Zagreb. The aim of the conference is to familiarize the participants with the current situation, opportunities and benefits of intermodal transportation in the region of Southeast Europe as well as to inform them about the possible ways of project financing from EU funds. First day of the conference, 12th October is dedicated to the presentation of the current situation, the pros and cons of the regional railway market liberalization, customs procedure sin the European Union, the regional logistics centers, business association, information technology and environmental aspects of regional intermodal system. In the afternoon, 6th International Scientific Conference „Ports and Waterways“ – POWA which deals with issues of water and land transport, will take place. On the 13th October, European funds which are dedicated or may contribute to the development of transport system will be presented. Operational Program for Transport, FP7 fund, TEN-T, Marco Polo II, IPA (Adriatic, SEE, MED, bilateral) and CIP will be discussed. Besides a theoretical introduction, all participants will have the possibility to partake in workshops with the goal of facilitating the application process for the above mentioned programs. All participants will have the opportunity to meet with practical examples throughout the documentation process and application forms for each program. The conference is being held in Croatian and English and participation is free. At today's session, Croatian government adopted the spatial plan for multipurpose canal Danube-Sava. The construction of the canal will be performed in three phases and could start next year. Danube-Sava canal is important for the development of Slavonia and East Croatia at the same extent as the construction of highways was for Southern Croatia, it was stated today at the session. This is the main reason for optimism that the Croatian parliament will unanimously accept the spatial plan. The idea for this big investment project dates back to 1737 and now the right time has finally arrived for the realization, said Prime Minister Jadranka Kosor. The project is estimated at 950 million EUR and encompasses two counties and 12 local government units. The construction will include five ports and terminals and 23 road and pedestrian bridges, added Kosor. Minister of environmental protection, physical planning and construction Branko Bačić noted that the canal will be built as a class Vb waterway which means that it will be navigable even for the largest inland ships. The canal encompasses three most important functions – navigation, irrigation and drainage. It also connects three most important Croatian rivers – Danube, Sava and Drava and will enable the development of river cruising tourist activities, which are more popular with each year. Construction of the canal will enable connection between X road and rail corridor with VII Danube corridor and Croatia will be positioned as Danube and Adriatic country, said Bačić. This canal will be a part of the 570 kilometres long complex transport corridor Danube-Adriatic Sea with combined inland navigation-rail transport connection, which will enable better connection of Croatia with Middle Europe. Canal will shorten the navigation on the Sava towards Western Europe for 417 kilometres which is two days and two nights less than the current normal time, while the navigation towards the Black Sea will be shorter for 85 kilometres. This project will also enable the irrigation of 35 750 hectares and drainage for 173 000 hectares of agricultural land, added Bačić. Vice President and Minister of agriculture, fishery and rural development Petar Čobanković expects new business zones along the canal which will attract new investors looking forward to use all the benefits of cost-effective river transport. I'm assured that in the future in this area the time will be divided as „before the canal and after the canal“, concluded Čobanković. We invite all interested parties to visit this website and enjoy the scenery of Posavina, both from Croatian and BiH side. Croatian companies HŽ Cargo, Agit, Kepol terminal, NESTRO Adria Slavonski Brod and Robno transportni centar Brod (RTC-Brod), together with OPTIMA group from Banja Luka, had signed an agreement on strategic partnership. The companies will be cooperating in business and strategic development in transport of crude oil and oil derivatives and will also jointly invest in HŽ Cargo oil terminal in the port Slavonski Brod. Zlatko Rogožar, chairman of the bord of HŽ Hrvatske željeznice holding and director of HŽ Cargo, said that this agreement will bring new profit of around 40 million EUR per year and a guarantee that the cons truction of the terminal will be finalized and ready for operation in the second half of 2012, in order to satisfy the needs of oil refinery in Bosanski Brod which is owned by OPTIMA group. Jurij Belov, director of OPTIMA group said that this agreement is very important for his company because it opens the door towards the Balkan market and further towards the sea. HŽ Cargo and other companies will take over the obligation of organization of transport and entire logistics, while OPTIMA group will transport around 2 million tonnes of crude oil and oil derivatives from the terminal in Slavonski Brod to the terminal in Zadar. Marijan Jurić, director of the Port Authority Slavonski Brod is also satisfied with this agreement because it brings possibilities for new development projects in the port Slavonski Brod. Janko Brnardić, director of the Inland Navigation Directorate of the Ministry of the Sea, Transport and Infrastructure, in interview to Vjesnik – one of the most important daily newspapers in Croatia, gave a detailed overview of current status of the inland navigation sector in Croatia, as well as future plans. The interview predominantly emphasized the current status of river Sava. Recent decision of the Minister of the Sea, Transport and Infrastructure regulates river Sava up to Brežice as class I river, which enables future navigation projects up to Slowenian border. Croatia was the leader in creating the initiative for rehabilitation and bringing back the navigability of Sava to the same level as in the nineties, but also with the help of International Sava River Basin Commission. Croatia is also the leader in the project for rehabilitation of this river up to Sisak and is project holder in front of international institutions. Rehabilitation means bringing Sava to the class IV navigability, which is the minimal class to satisfy the international character of inland waterway. At certain stretches Sava has class IV navigability, but most of the river is class III. However, there are also problems in maintaining the class III navigability because of the uncontrolled exploitation of gravel. Croatia had prohibited the possibility of granting the concessions for exploitation of gravel, excluding the cases for navigability maintenance. Brnardić says that the Sava rehabilitation project is in the final phase and drafting of the main project was nominated for European fund IPA. It is expected that the contract for the main project will be signed by the fall, which will later enable for the project to be nominated for EU structural funds. Inland Navigation Directorate had nominated many projects for the IPA fund, but the real test project is Sava project and if this project passes other eight projects connected to the port infrastructure are also assured. After Croatian independence the conditions in river ports was very poor. This status was presented to the European Commission, which had accepted the development projects. All the projects which are now in the designing phase and which are financed through the European pre-accession funds, in the construction phase will be financed through the structural funds. This makes four inland ports nominated for the funds, including the new port Vukovar East. Luka Osijek is nominated for IPA the projects for reconstruction of the south bank, new transport infrastructure and construction of dry bulk terminal. Development of the industry is also planned in Croatian inland ports. Inland ports in general have much bigger territory than the sea ports and the aim is to bring the industry in the port area, which is the practice of the EU. Beginning of fall the licence for the construction permit is expected for the new bioethanol factory in the area of port Osijek. In port Slavonski Brod two concessionaires wish to build the facilities and certain preliminary contracts had already been signed. HŽ Cargo is one of the biggest concessionaires in the port Slavonski Brod, transhipment facilities for dangerous cargo are being built, and there is also interest for construction of bioethanol factory in the port. Port Sisak is today completely privatized. The first cargo which was shipped towards Danube from Sisak is from the US owned ironworks. The development of the factory for concrete elements is also expected and the owner is one Austrian company which plans to transport mostly via inland waterways. Brnardić also considered the environmental aspect of the rehabilitation of Sava. Environmental associations were often alarming that Croatia is canalizing river Sava. It should be stressed here that all the elements of environmental protection were protected and that river Sava stays in its natural course. Project for the rehabilitation of the river Sava was created in such a way that manages to satisfy the requirements from various parties, except the ones who claim that nature should stay untouched. Until Croatian entrance to the European Union, the construction permit for river Sava could be obtained, which is the prerequisite for access to the structural funds. According to the mid-term plans the entire Sava river project should be finished by 2018. This could enable the complete regulation of Sava as class IV navigable river up to Sisak, which means that the depth of 250 cm could be guaranteed for 300 days in a year. Croatia is also participating in all European programmes and projects dedicated to navigation. Croatian state is also the majority shareholder of Inland Navigation Development Centre (CRUP), which achieved excellent results in Europe in development of software and hardware for safety of inland navigation. It should be also stressed that during the negotiations European Commission had especially positive opinion on navigation sector and the negotiations in that chapter were finished without any remarks. Vjesnik also brings short overview of Captain Mario Babić, state secretary of the Ministry of the Sea, Transport and Infrastructure, regarding the future of moving transport from the roads to the rivers. Captain Babić says that in the future special attention will be given to inland waterway transport in Europe, because the current trend is to shift the cargo from the roads to more cost efficient and environmentally friendly type of transport, mainly river transport. EU also allows subsidies for carriers which redirect their transport from roads to rivers. In Croatia roads and highways are still not overcrowded as in the west, but the environmental and financial aspects are also valid here, because inland waterway transport is cheaper than the road transport. In this respect, all the plans of the Ministry are oriented in that direction. However, no project will start without the consultations with responsible authorities and without corresponding studies, which was also the case with Sava project. All the measures which were proposed for the revitalization of Sava don't exceed the dimensions before the war. Babić also adds that the Ministry directed its efforts towards the EU funds in order to ensure the projects for maintenance of inland waterways and construction of ports. However, resources for this aim are also ensured in the state budget. Croatian government had founded Agency for inland waterways, and port authorities are established, similar as on the sea. Safety aspect of the navigation is also important and the project for automation of river transport management is partly finished. There is a trend in Europe in excavation of special canals for establishment of navigable waterways, while in Croatia the only necessity for canals is Vukovar-Šamac canal. Captain Babić adds that it is important to establish good connections between sea and inland ports. The example was former cooperation between ports Rijeka and Vukovar - bulk cargo from Rijeka was unloaded in Vukovar and further transported via inland waterways. When the 5c corridor is finished, which passes near Vukovar and Slavonski Brod, this opens huge possibilities for these two cities, but also for port Ploče. At the end Captain Babić says that he believes that in the fall Croatian parliament will adopt the spatial plan which will deal with the canal Vukovar-Šamac, which will contribute to the special importance of the river Sava.